"We may have underestimated the psychological realms of birds," von Bayern said. "Jackdaws, amongst many other birds, form pair onds for life and need to closely coordinate and collaborate with their partner, which requires an efficient way of communicating and sensitivity to their partner's perspective." We all know that people sometimes change their behavior when someone is looking their way. Now, a new study reported online on April 2nd in Current Biology shows that jackdaws—birds related to crows and ravens with eyes that appear similar to human eyes—can do the same. When presented with a preferred food, hand-raised jackdaws took significantly longer to retrieve the reward when a person was directing his eyes towards the food than when he was looking away, according to the research team led by Nathan Emery of the University of Cambridge and Queen Mary University of London. The birds hesitated only when the person in question was unfamiliar and thus potentially threatening. In addition, the birds were able to interpret human communicative gestures, such as gaze alternation and pointing, to help them find hidden food, they found. The birds were unsuccessful in using static cues, including eye gaze or head orientation, in that context. 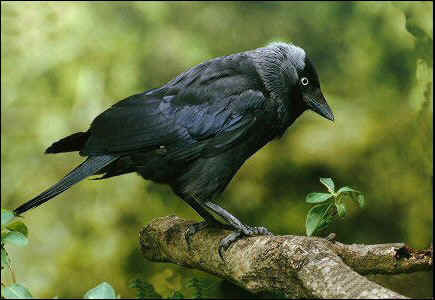 Unlike most birds, jackdaws' eyes have a dark pupil surrounded by a silvery white iris. The researchers said they believe jackdaws are probably sensitive to human eyes because, as in humans, eyes are an important means of communication for them. The hand-raised birds examined in the study may be even better than wild jackdaws at attending to human gaze and responding to the gestures of the people who have raised them. The findings are particularly notable given that most other species investigated so far, including our closest relatives the chimpanzee and "man's best friend," the dog, are not particularly sensitive to eye orientation and eye gaze, von Bayern said. Rather, she continued, chimps and dogs seem to rely on other cues such as head or body orientation in determining the looking direction of others and do not appear to appreciate the eyes as the visual organs. The results suggest that birds may deserve more respect for their mental abilities. "We may have underestimated the psychological realms of birds," von Bayern said. "Jackdaws, amongst many other birds, form pair onds for life and need to closely coordinate and collaborate with their partner, which requires an efficient way of communicating and sensitivity to their partner's perspective." The researchers include Auguste M.P. von Bayern, of University of Cambridge, Madingley, UK; and Nathan J. Emery, of University of Cambridge, Madingley, UK, and Queen Mary University of London, UK.